Context: The narrator’s family lives in a cramped, ant-infested house in Bangalore, the ants a metaphor perhaps for the inherent anxiety of an almost destitute household. Later their fortunes are changed but that anxiety never goes away. We had two types of ants at home. One was a small brisk-moving black variety that appeared only occasionally. But when it did, it came in an army numbering thousands. These ants wandered everywhere in apparent confusion, always bumping heads and pausing before realizing something and rushing off in random directions. They had no discernible purpose in life other than trying our patience. It didn't seem like they were here to find food. Nor did they have the patience to bite anyone. Left to themselves, they'd quickly haul in particles of mud and built nests here and there in the house. You could try scuttling them with a broom, but they'd get into a mad frenzy and climb up the broom and on to your arm. Before you knew it, they'd be all over you, even under your clothes. For days on end there would be a terrific invasion, and then one day you'd wake up to find them gone. There was no telling why they came, where they went. I sometimes saw them racing in lines along the window sill in the front room, where there was nothing to eat. Perhaps they were on a mission of some sort, only passing through our house in self-important columns. But not once did I see the tail of a column, an ant that had no other ants behind it. The other type of ant was a brown variety with more intelligence. These weren't particularly fast, but they had about them a clarity, a sense of purpose. You never found them rushing about aimlessly, killing time. But if there was as much as a speck of food to be had, they'd somehow find out, turn up in orderly lines, and with great concentration haul bits of food out through a corner of the window or into a hole in the floor we'd never noticed before. These ants could drive Amma mad. She would not stand the knowledge that everything we were eating had first been tasted by ants. She took to creating a moat around whatever she cooked, placing the vessel in a broad plate filled with water. Even then some of the ants would try to swim across and perish in the process. The slightest lapse on our part - a box with a lid that wasn't shut tight, a serving spoon lying unwashed - immediately came to the attention of these ants. If a single grain of rice dropped outside the plate, you would see ants deliberating its transportation before you rose from your meal. If one of us carried a snack out to the middle room, ants would carry away crumbs we hadn't even realized we'd dropped. They'd gather around rings left by tea cups on the floor. A mortar used to make chutney and washed a little casually? Ants. Coconut grated and shell left lying around for a minute? Ants to finish off any remaining specks. Charred flakes around the edge of the dosa pan? Within no time - ants. Amma was obsessive about washing vessels. She'd scrub vessels clean immediately after she finished cooking. Malati and I were trained to wash cups and plates as soon as we were done with them. Looking back, it's possible all this had nothing to do with cleanliness and was simply part of Amma's struggle against the ants. It was a losing battle though. For all that we did to keep them at bay, they'd seize on the smallest lapse and invade. Just when we thought we had the upper hand they'd turn up in the most unlikely places. I once opened my compass box to find it swarming with ants. Amma resorted to chemical warfare - all sorts of powders and poisons. She made a dough from flour and gammexane powder and sealed cavities behind which the ants were suspected of having their hideouts. Whether this killed any ants or not, it at least prevented Amma from feeling entirely powerless. The rest of us too were hardened by strife. It became a reflex to reach out and squash a stray passing ant. On someone's advice Amma started treating the house with neem smoke. An old tin box was reserved for the purpose. About once a week, burning coals would be tipped into it over a base of sand, and handfuls of neem leaves thrown in. It produced thick smoke. Amma covered her nose and mouth with the end of her sari and took the fuming box around the house, letting it linger in corners and behind the cupboard. Once I woke up in the middle of the night to go to the toilet and found Amma in the kitchen. She was on her haunches, facing the wall, tracing the path of a line of ants using a flashlight. Now, unlike rats and cats, ants don't make things fall in the night and wake people up. I can only imagine the clamour they must have created in her mind. At one stage, she even went around meeting officials and got the corporation to fog the neighbourhood. It's impossible to say whether it made a difference. We still had ants. We had no compunction towards our enemies and took to increasingly desperate and violent means of dealing with them. We'd flatten them with our hands or feet or books wherever we saw them. If we noticed that they'd laid siege to a snack, we might trap them in a circle drawn with water and take away whatever they were eating. Then watch them scurry about in confusion before wiping them off with a wet cloth. I took pleasure in seeing them shrivel into black points when burning coals were rolled over a group of them. When they attacked an unwashed vessel or cup they'd soon be mercilessly drowned. I suppose initially we did these things only when we were alone, but in time we began to be openly cruel to ants. We saw them as demons come to swallow our home and became a family that took satisfaction in the destruction of ants. We might have changed houses since, but habits are harder to change. 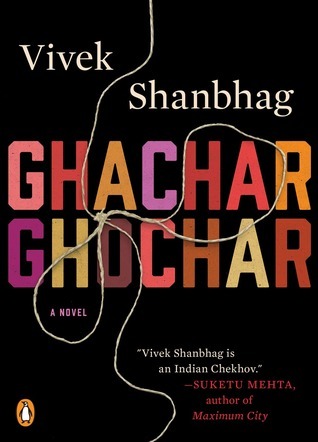 Ghachar Ghochar is a 2015 psychological drama novella written by Kannada author Vivek Shanbhag and was translated into English by Srinath Perur. Set in Bangalore, the book is about an unnamed narrator who reminisces about his dysfunctional family's rags-to-riches story which results in troubling behavioural changes in each of them. The title is a made-up phrase which means "tangled up beyond repair".